Formula D by Asmodee is a racing game that lets the players take the role of either Formula 1 or street racers, risking everything for a chance to be first across the finish line. 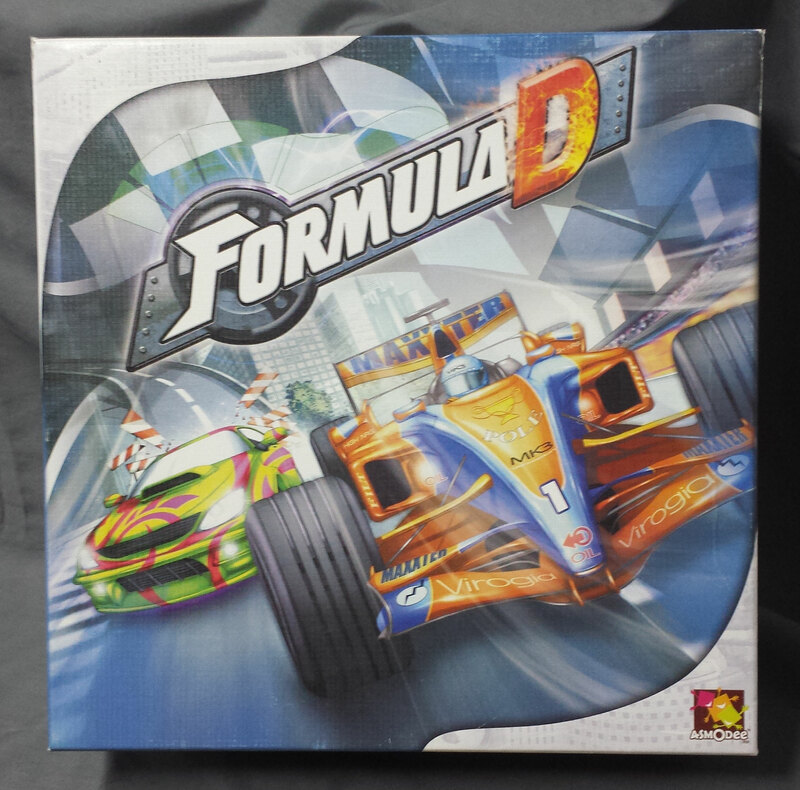 The game came out in 2008 as a reprint of Formula De’, adding a street race side to each board and streamlining some of the rules. It’s included in The Dice Tower Hall of Fame and won The Dice Tower Best Reprint and Best Family Game awards that year. 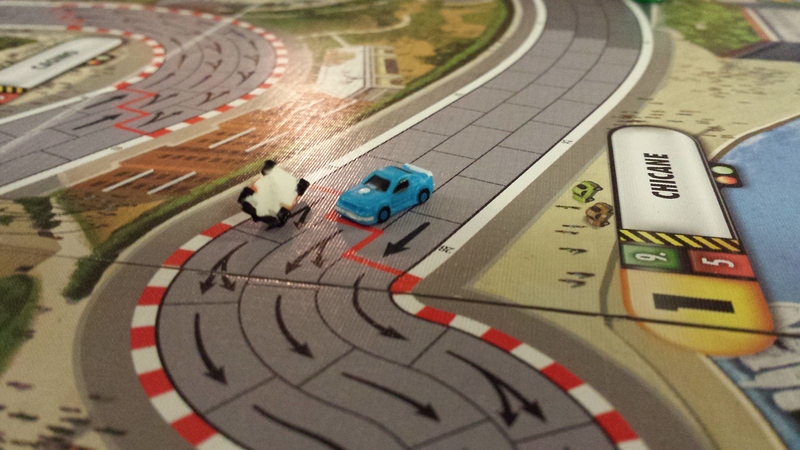 At it’s core, Formula D is a roll and move style game, but several key features leave similar games in the dust. The ability to shift gears up or down and roll the corresponding die, require you to plan ahead because you want to optimize each role to get the most distance, but also position yourself correctly to make the required number of stops each turn. All of this, combined with a quick and simple rule set and the ability to support up to 10 players, make for a really fun family or party experience. Cars and music have always gone hand in hand, though I guess one could argue that the original Model-T’s stereo was a bit lacking. For me, gaming and music pair the same. One of my favorite rituals when getting a new game is putting on some music and unboxing the game. The Wednesday game group I host is full of music fans and we have compiled, and continue to refine, a general playlist of songs everyone wants to hear while we are rolling dice and moving meeples. When we started a Formula D race league, it became obvious that a racing playlist was in order. We assembled almost 160 tracks for when we play the game. I have pulled some of the songs I consider essential to any Formula D playlist, and compiled them below for your listening pleasure. The Approach: How to whittle down 159 songs to a manageable post? Radio friendly songs have historically fluctuated between three and four minutes (Interesting, quick read as to why from Vox.com) in length. The suggested game time for Formula D is about 60 minutes (which is way low if you play with more than five people and partake in any table talk, but that is what they list, so that is what I used). I applied a very unscientific thumb in the air method, coming up with 17 songs that I think need to be on any Formula D playlist, and would get your group through a session of the game. Obviously, most songs have to do with cars and/or racing, but a couple won a spot on the list based on that feeling they give the listener, which usually causes the foot to weigh a bit heavier on the gas peddle, the window to ease itself down into the open position, and the radio to creep up in volume. I hope you enjoy and better yet, I hope you give these songs a spin the next time Formula D is on your game table. 1. Motley Crue – Kickstart My Heart: This song is all about adrenaline and speed; the perfect way to start your game. If there is ever a game made about naked skydiving, this song will make that list too. 2. The Eagles – James Dean: James Dean embodied the rebellious, racing spirit, but on September 30,1955, James Dean’s life came to a sudden and tragic end. “Too fast to live, too young to die,” goes the song. For whatever reason, The Eagles get a lot of flack from music fans. I went through that phase once. Glad I’m over it. 3. Chuck Berry – Jaguar and Thunderbird: Chuck Berry is Rock and Roll. Period. 4. Jan & Dean – Drag City: Jan & Dean helped create the Surf Music craze of the early 60’s. Dean Man’s Curve might be the better known song (and an honorable mention), but Drag City has more of a racing feel. One of two songs on the playlist with a groovy engine sound at the start of the song. 5. ZZ Top – Pan Am Highway Blues: For good reason, you just don’t hear songs about drinking and driving anymore, even if it’s because you’re trying to drive her off your mind. For example, you will never hear a song like Sammy Hagar’s Cruisin’ and Boozin’ recorded in this day and age. That said, you’re just rolling dice, so feel free and enjoy your favorite beverage (make sure you have a ride home). 6. AC/DC – Highway To Hell: Where you will head if you take Sammy or ZZ Top’s advice? Probably straight on this highway. Solid back-beat and huge riff’s will make sure everyone at your gaming table is banging their head, whether they know it or not. 7. Aerosmith – Sweet Emotion: The first in a few songs that are on the list but not necessarily about racing or cars. That said, it has all the rev and swagger of any muscle car and frankly, there is not a stereo that can get loud enough to handle this song. If you don’t think it belongs on the list, check out the opening scene of Dazed and Confused. Now, play it again. Louder. 8. Chuck Berry – Maybelline: Only two artists made the list twice. It could be argued that Chuck Berry was the only one truly deserving of double inclusion. See number 3 for the reason why. 9. Sammy Hagar – Let Sally Drive: I Can’t Drive 55 would’ve been the obvious choice, but this song is just plain better. It’s got rhythm, it’s got drive, and it feels like driving fast. Sammy is one of those car rockers, where you could make an entire racing playlist with just his songs. Like him or not, he can pen a song. No argument to be had. 10. Rush – The Spirit Of The Radio: The second artist to make the list twice, only because this song is so incredibly good. I am surprised when this comes on in my car and I don’t get a speeding ticket. It’s also one of those songs that never gets played once. In fact, I have made entire commutes with The Spirit Of The Radio being the only song played. There is an openness, a freedom and energy to this song the defines what rock and roll is and should be. 11. Stray Cats – Built For Speed: The Stray Cats don’t get near enough respect. Brian Setzer is one heck of a guitarist. They captured the spirit of the 50’s, thirty plus years later. 13. Rush – Red Barchetta: Inspired by a 1973 Road & Track short story (A Nice Morning Drive), how can this NOT be on the list? If you can time your move to sync with the tire screech around the 3:20 mark, you should get an extra turn. 14. Eddie Cochran – Summertime Blues: Another singer and song that defines rock and roll and rebellion. The Blue Cheer cover gets a huge nod, but I had to include the original. 15. Judas Priest – Heading Out To The Highway: One of several Priest songs about cars and rolling out to destinations unknown. Bad day at work, put this on. Shift up and roll high! 16. Jerry Reed – East Bound And Down: There are probably several country songs that could have made the list, but they weren’t recorded by Jerry Reed and weren’t the theme for a move starring Burt Reynolds about bootlegging Coors Beer (really?) from Texarkana to Georgia in 28 hours. Smokey and the Bandit was the second highest grossing film of 1977, behind Star Wars. Cool. 17. Joan Jett and the Blackhearts – Light Of Day: You’ve made it around the last turn and shift up to sixth gear. Roll the blue die and hope you don’t blow your engine! This song should give you the boost you need.